If you were around during the '90s, I'm sure you've seen (or have at least heard of) Tim "The Tool Man" Taylor and his shenanigans on the TV sitcom Home Improvement. His constant love of making machines that could produce more power than they should have rightly been able to got him in a few sticky situations on the show, but the idea that you can just do a little bit of customization to your machine and get more performance out of it is a much more appealing thought than overdoing it. With products like the Phoenix Performance Exhaust Insert, you can add a little more punch to your Honda without the risk of something blowing up in your face. The Exhaust Insert fits in any stock Honda EX400 from 1999-2009 and is ridiculously easy to install. All you have to do is unbolt the factory unit (on the end of the stock muffler) and using the hardware provided bolt on the new insert. The Phoenix Insert will give you 10-15% more power instantly and produce louder sound (at right around 92dB) to help you get noticed out on the road. 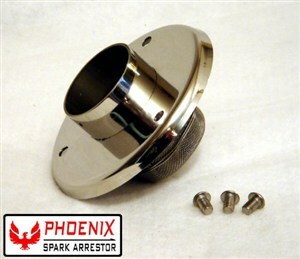 It's polished 304 Stainless Steel and will not rust or discolor. It's not the same as adding a new exhaust system to your bike, but it's an inexpensive alternative to add a little sound and power to it.